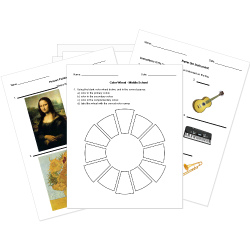 You can create printable tests and worksheets from these Grade 4 Arts questions! Select one or more questions using the checkboxes above each question. Then click the add selected questions to a test button before moving to another page. What are the spaces, in order, on the treble clef? What are the lines, in order, on the treble clef? Which 4 instruments belong to the string family? An interval that is eight notes apart is called what? What connects two notes that are the same? How many people are in a duet? In 4/4 time, the quarter note receives the beat. A 3/4 meter sign tells us there are 3 beats per measure and the quarter note equals 1 beat. What are the 3 instrument families found in a concert band? What type of song shows pride in our country? The bottom note in a time signature tells us which note receives the beat.